Krill are small (up to 60 mm long) shrimp like creatures that can be found in huge aggregations in Antarctic and South Georgia waters. Vessels from Japan and the former Soviet Union began to fish for krill at South Georgia, and around Antarctica, in the 1970s. 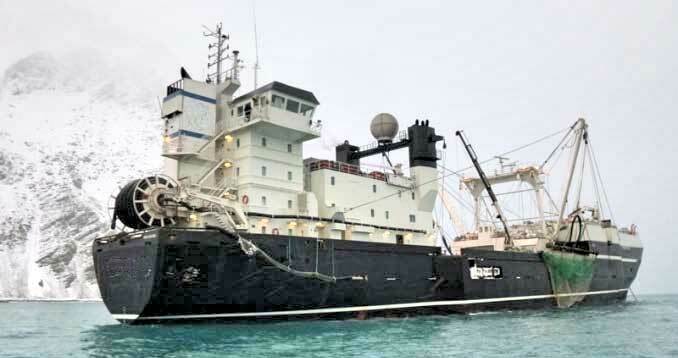 Vessels from other nations quickly joined the fishery, which peaked at over 500,000 tonnes in the early 1980s. 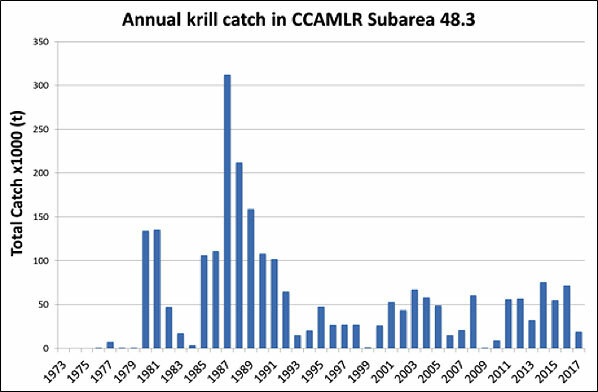 Concern over the rapid expansion of the krill fishery and the potential impact on non-target species led to the establishment of CCAMLR in 1982. Catches dipped in the 1980s, largely due to the discovery of high fluoride levels in the krill exoskeleton and the associated processing problems. Catches dropped again in the 1990s due to the break-up of the former Soviet Union. The amount of krill fished at South Georgia can be seen in the table below. The variations are down to environmental conditions and vessels will fish further south when sea ice conditions allow and where South Georgia’s management requirements do not apply. The MPA Order (2013) introduced a formal seasonal closure between November 1st and March 31st alongside other measures including no-take zones. This minimises any risk of competition between the fishery and krill dependent predators, particularly the land-based predators that are constrained in their foraging ranges during the breeding season. The Government continues to undertake research in this area to ensure its management measures are guided by the best science. Krill are caught in pelagic nets and there is little by-catch. Fur seals have occasionally been caught in the past, but now escape panels are mandatory and no fur seals have been reported caught since 2003. In recent years, continuous trawl gear has been developed, which continuously returns the catch from the net to the vessel for processing. This is highly efficient and can result in a single vessel catching 800 tonnes per day. Simultaneously, new processing technology has been developed to extract krill oil, which is used in the health food industry. Krill trawler in Cumberland Bay.